We present a new edition of nice minerals at affordable prices. We highlight the old Panasqueira pieces that belonged to an old miner who worked in the mines over 70 years ago. 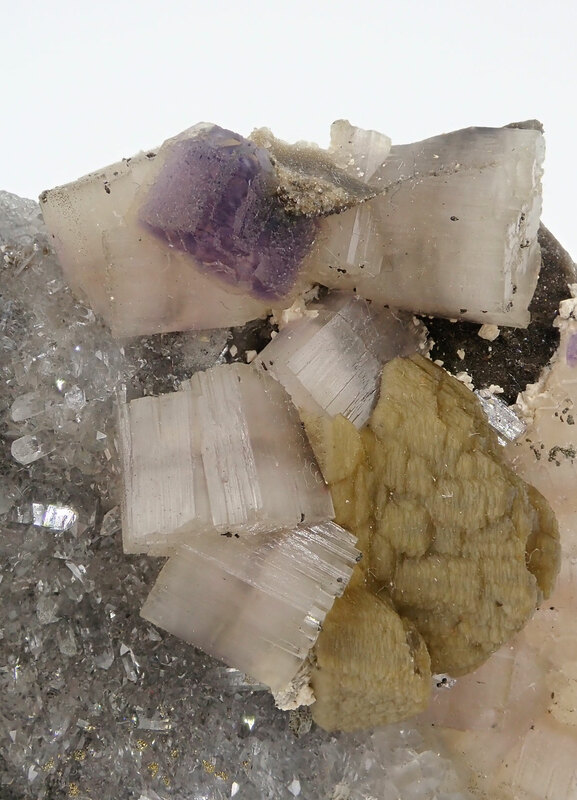 AM01- Fluorite, Fluorapatite, Siderite and Quartz. Panasqueira mines, Covilha, Castelo Branco, Portugal. 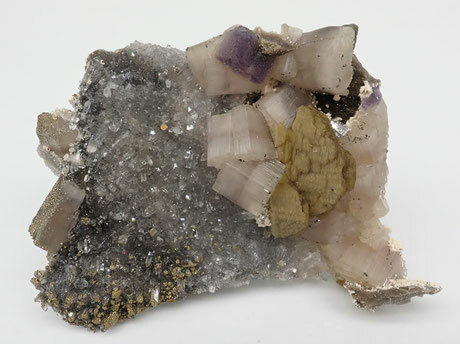 Group of very well formed prismatic crystals of Fluorapatite accompanied by two crystals of Fluorite with a vivid purple color and Siderite disposed on a matrix of crystallized Quartz. The Fluorapatite crystals show a interesting color zoning, with a middle line with a purple color. The specimen is in perfect condition without damage. 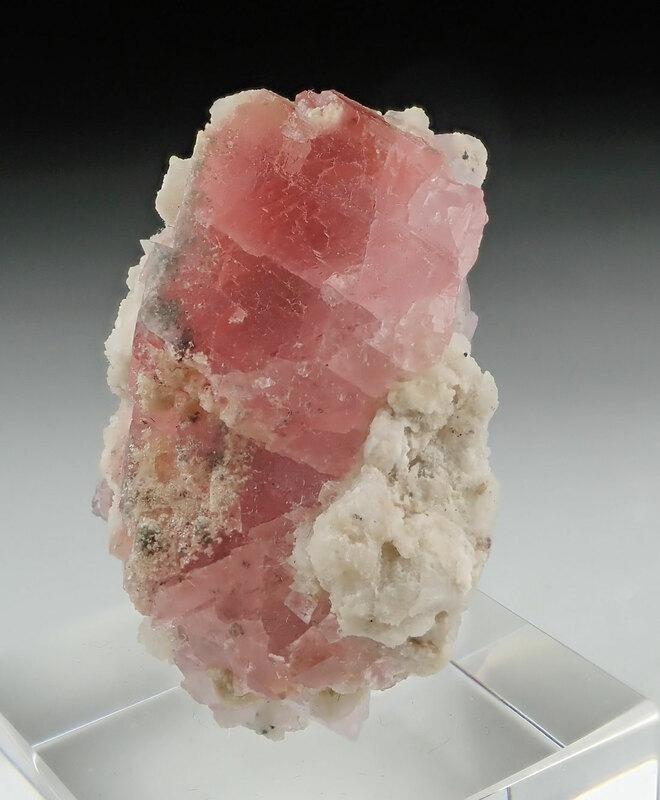 This one is a rare and unusual specimen from the Panasqueira mines coming from an old Panasqueira miner. It was extracted circa 1975. Watch video. 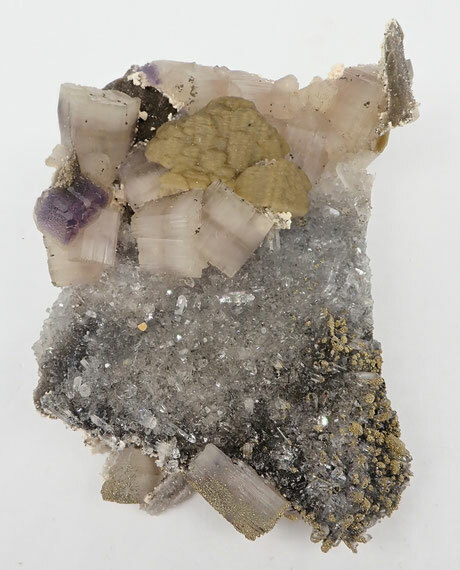 AM02- Fluorapatite, Arsenopyrite, Chalcopyrite and Sphalerite. Panasqueira mines, Covilha, Castelo Branco, Portugal. Group of well-formed crystals of Fluorapatite coming from a 2018 find in the Panasquera mines, never seen before. The crystals look like porcelain, showing also a color zoning. 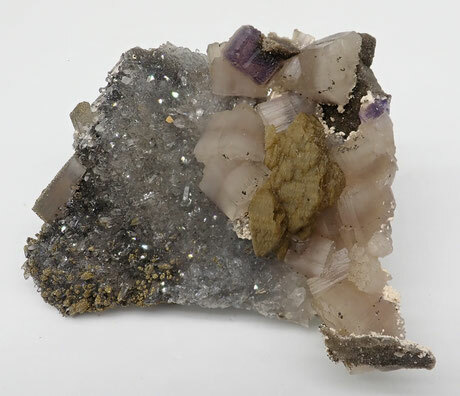 On a matrix composed of crystals of Arsenopyrite, Chalcopyrite and Sphalerite. In excellent condition. Watch video. AM03- Cassiterite. Panasqueira mines, Covilha, Castelo Branco, Portugal. Group of lustrous crystals of Cassiterite, showing cyclic twins, perched on a matrix of Muscovite mica. This piece comes from a old find in the mines of Panasqueira, circa 1975, and belonged to an old miner. In perfect condition. Watch video. 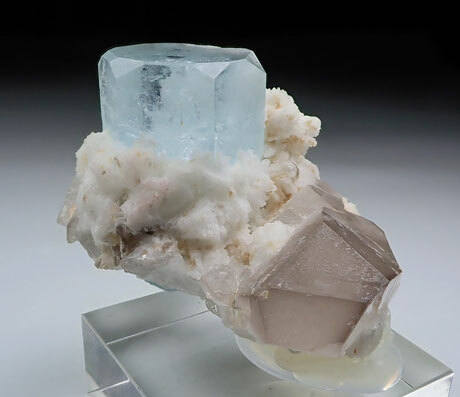 AM04- Fluorapatite and Quartz. Panasqueira mines, Covilha, Castelo Branco, Portugal. Nice lilac Fluorapatite specimen coming from a former collection that belonged to an old Panasqueira miner. It was extracted circa 1975 and found in the first level of the mine. 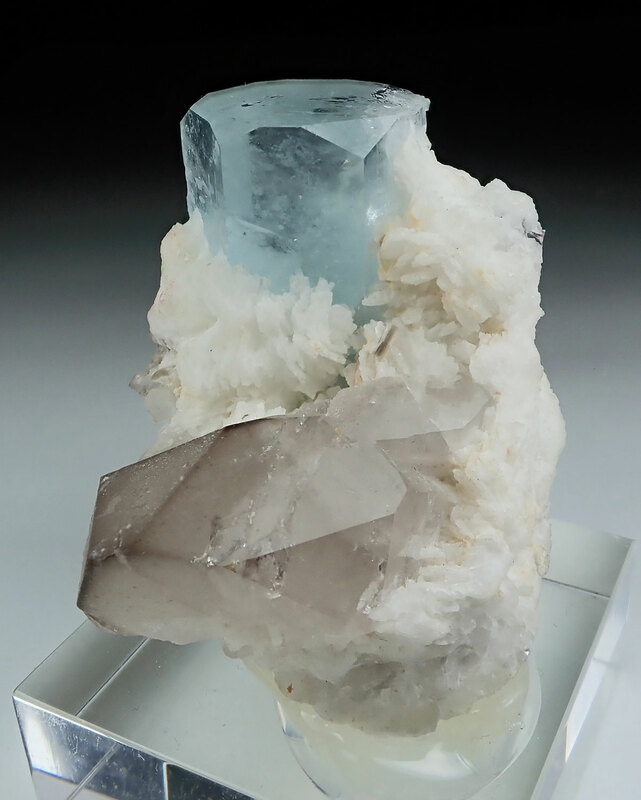 It is composed of two Fluorapatite crystals with a very interesting lilac color zoning. With a crystal of Quartz. 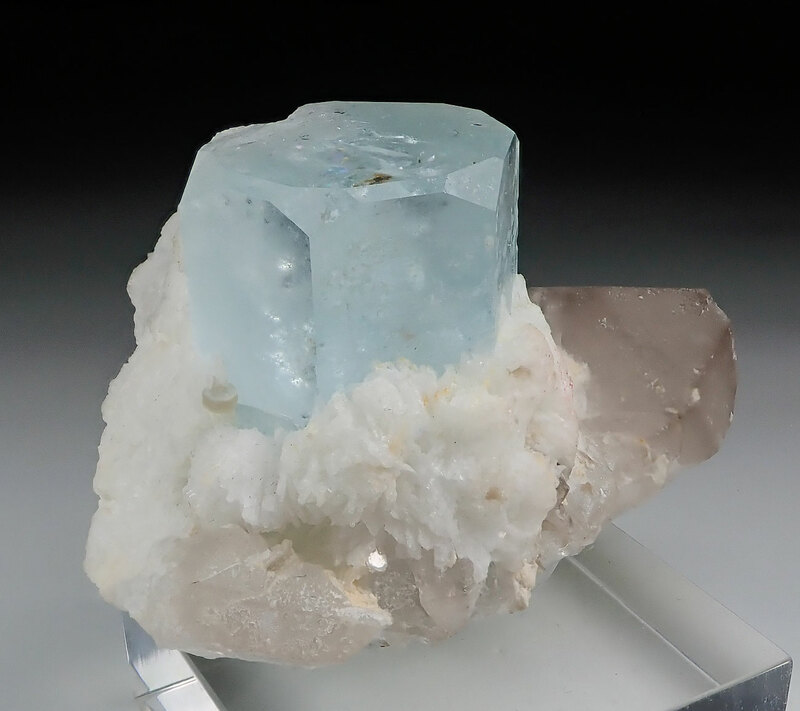 The Fluorapatite crystals are in perfect condition without damage. This kind of pieces are very difficult to get nowadays. Watch video. 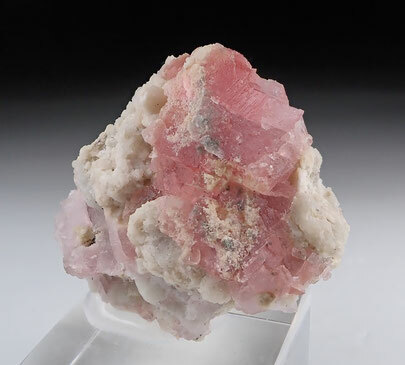 AM05- Fluorapatite. Panasqueira mines, Covilha, Castelo Branco, Portugal. 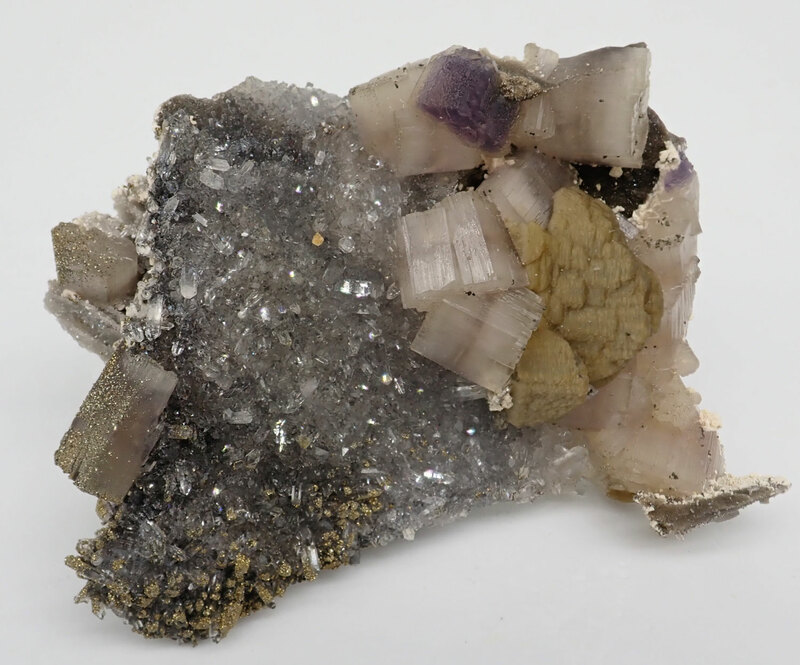 Prismatic Fluorapatite crystals with a light lilac color disposed on a matrix of Muscovite. The crystals are very well developed with sharp faces and edges. It comes from a find circa 1975. Without damage. Watch video. AM06- Gwindel Quartz. Grimsel Pass, Hasli Valley, Bern, Switzerland. Group of individual smoky Quartz crystals stacked together and forming a very nice Gwindel crystal. In very good condition and shape. Very nice colour and high transparency as seen. With Hematite. 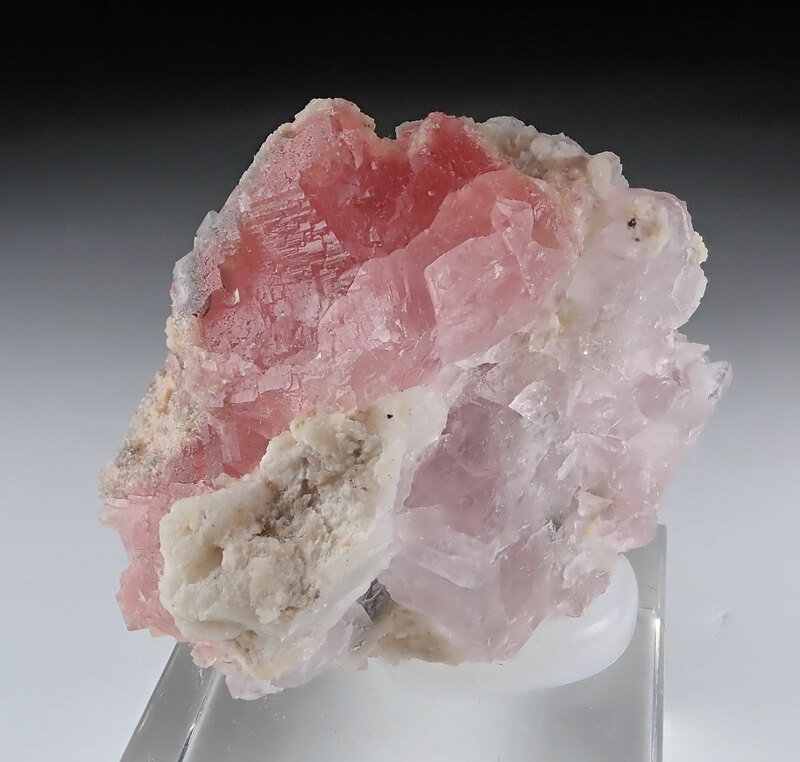 A fine Alpine Gwindel Quartz. No damage. Watch video. AM07- Fluorite. Glacier d’Argentiere, Mont-Blanc Massif, Chamonix, France. 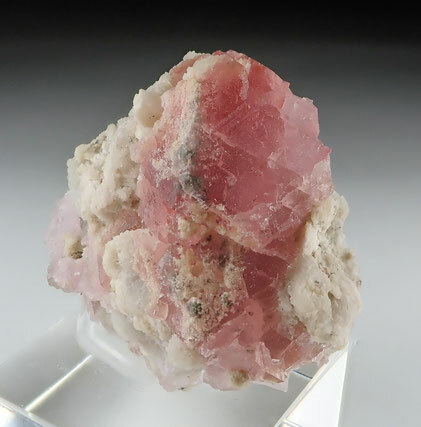 Alpine Fluorite crystal with beautiful red-pink color and with Albite matrix. A very nice Alpine Fluorite. In very good condition. Watch the video. AM08- Fluorapatite. Cerro Mercado, Victoria de Durango, Durango, México. Very well formed prismatic crystal of Fluorapatite with a vivid yellow color and completely transparent. On matrix of white Chalcedony. In excellent condition, no damage. Watch video. 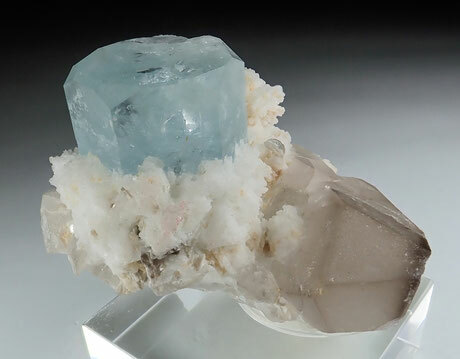 Aerial crystal of Aquamarine with very well defined faces and edges, high transparency and nice color. It is settled on a matrix of Albite, variety Clevelandite, with a Quartz crystal. The condition of this fine specimen is excellent. Watch video. AM10- Kobyashevite, Calcite and Gypsum. Ojuela mine, Mapimí, Durango, México. Very unusual and showy specimen of rare blue-green Kobyashevite combined with Gypsum and overgrowing Calcite crystals. Nice piece. From a new find at Mapimí, not much was found. Kobyashevite is a rare copper mineral. The condition is excellent. Watch video. AM11- Erythrite. Bouismas Mine, Bou Azzer, Tazenakht, Ouarzazate Province, Morocco. A sweet miniature with an exceptional isolated crystal set of Erythrite that stands out from the matrix. With other aggregates of Erythrite on the matrix. Bou azzer is the best location for many Cobalt minerals and especially for Erythrite. Watch video. AM12- Byxbyite and Topaz. Topaz Mountains, Thomas Range, Juab County, Utah, USA. 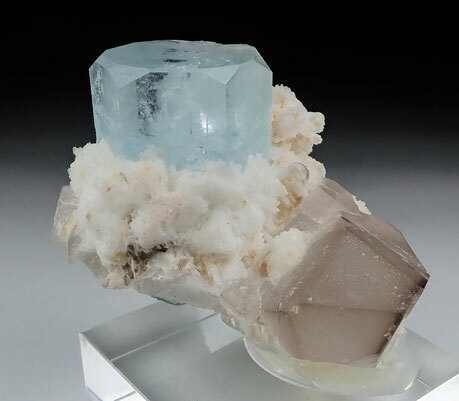 Great combination specimen composed of a sharp and lustrous crystal of rare Bixbyite combined with lustrous and translucent Topaz crystals with a nice orange color. In excellent condition, no damage. Watch video. AM13- Tanzanite. Merelani Hills, Lelatema Mountains, Manyara,Tanzania. Parallel growth of prismatic crystals of Tanzanite, with wonderful colors, high luster, glassy, very good transparency and with sharp shape. Complete all around 360 degrees. The condition is very good - some minor nicks. Watch video. AM14- Tanzanite. Merelani Hills, Lelatema Mountains, Manyara, Tanzania. Prismatic transparent crystal of Tanzanite, with wonderful color, high luster, glassy and with sharp shape. Complete all around 360 degrees. The condition is very good - some minor nicks. Watch video. Group of crystals of Bournonite forming very well formed ciclic twins, type "cogwheel". On matrix with Pyrite and other Sulphides. In very good condition. Watch video. AM16- Chalcopyrite, Pyrite, Sphalerite, Quartz. Cavnic mine, Cavnic, Maramures, Romania. Combination specimen composed of glossy crystals of Chalcopyrite, Pyrite, Sphalerite and Quartz. Nice association formed by fine crystals. The condition is very good. Watch video. AM17- Aquamarine with Albite. Erongo Mounatins, Erongo, Namibia. Nice Aquamarine coming from the Erongo Mountains. Two aerial crystals with nice color and very good transparency and disposed on a matrix of Albite. No damage. Watch the video. AM18- Aquamarine with Schorl and Albite. Erongo Mounatins, Erongo, Namibia. Prismatic crystal of Aquamarine with very well defined faces and edges, nice color, lustrous faces and good transparency. Associated to Schorl crystals and Albite. The condition is very good as seen. Watch video. AM19- Andradite variety Demantoid. Piedra Parada, Veracruz, Mexico. Sharp crystal of Andradite, variety Demantoid, with very well formed and defined faces and edges. The crystal combines the forms of the trapezohedron with the dodecahedron. Aerial position on matrix. No damage. The locality is very unusual for the specie. Watch video.